Perhaps it’s the dark times we’re living through, but lately I have been drawn to stories of heroes and rescuers. Like this New York Times piece titled “The Japanese Man Who Saved 6,000 Jews With His Handwriting,” which describes the work of Chiune Sugihara, who ran the Japanese consulate in Lithuania during World War II. Defying his government and sacrificing his career, he issued transit visas to Jews fleeing German-occupied Poland, writing as many visas in a day as were normally issued in a month. His wife would massage his painfully cramped hands every evening. When he was finally forced to leave the country, he threw visas out the train window to refugees on the platform. The article says that more than 40,000 people are alive today because of this one man. The photoblog Humans of New York recently ran a series on heroes of the Rwandan genocide. I was especially moved by the story of a brave pastor who hid more than three hundred people in his church, saving their lives. Most of us will never have our courage tested to this extreme. Day-to-day, our heroism may consist of nothing more than rescuing a spider from the bathtub. But when the need arises, we can step up however we are called. 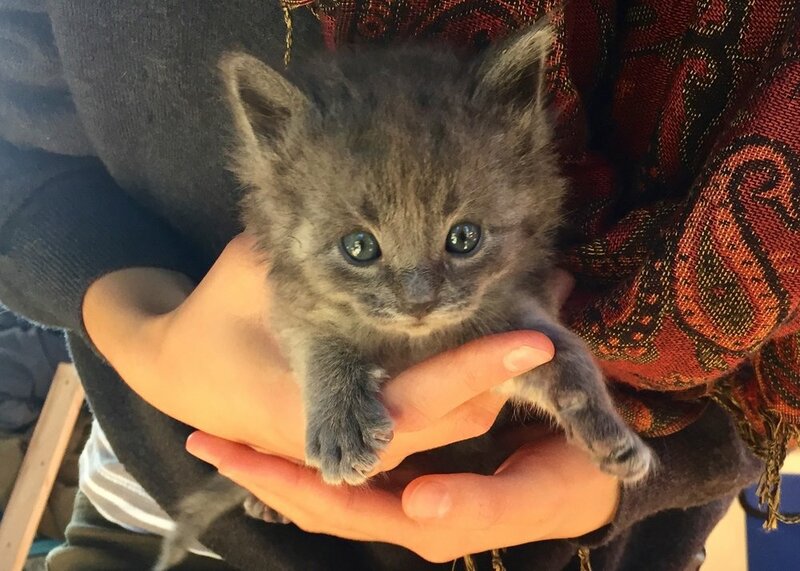 For example, my daughter’s friend Amelia was out running last month when her dog alerted her to a two-day-old kitten abandoned by the side of the road. She took him home and spent weeks feeding him formula from a dropper every three hours, day and night. Renaldo at four weeks, eyes open and ready for adventure. Despite all her care, it was not clear if this tiny hairless bundle would survive. But now he is a healthy, curious five-week-old named Renaldo who is busy exploring his world. A world that includes its share of suffering, but also people who show great compassion and courage in times of need. And for that I am grateful. Happy Thanksgiving! Thanksgiving sale: Use promo code TAKE20 to get 20% off all orders over $20. Sale runs through this coming Monday, November 26. Made in Humboldt event: You can now find my calendars, prints and boxed notecards at the “Made in Humboldt” event at Pierson Garden Shop through Dec. 24. Holiday fair: Makino Studios will have a booth at just one fair this holiday season: the Holiday Craft Market, Dec. 8-9 in the Arcata Community Center. New holiday notecards: Check out my four designs of boxed holiday notecards! 2019 calendar: This 2019 mini-calendar of art and haiku makes a great holiday gift—and don’t forget one for yourself!